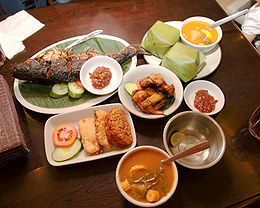 Example of Indonesian Sundanese meal; ikan bakar (grilled fish), nasi timbel (rice wrapped in banana leaf), ayam goreng (fried chicken), sambal, fried tempeh and tofu, and sayur asem; the bowl of water with lime is kobokan. Throughout its history, Indonesia has been involved in trade due to its location and natural resources. Additionally, Indonesia’s indigenous techniques and ingredients were influenced by India, the Middle East, China, and finally Europe. Spanish and Portuguese traders brought New World produce even before the Dutch came to colonise most of the archipelago. The Indonesian islands The Moluccas (Maluku), which are famed as "the Spice Islands", also contributed to the introduction of native spices, such as cloves and nutmeg, to Indonesian and global cuisine. Indonesian cuisine often demonstrates complex flavour, acquired from certain ingredients and bumbu spices mixture. Indonesian dishes have rich flavours; most often described as savory, hot and spicy, and also combination of basic tastes such as sweet, salty, sour and bitter. Most of Indonesians favour hot and spicy food, thus sambal, Indonesian hot and spicy chili sauce with shrimp paste, is a staple condiment at all Indonesian tables. Seven main Indonesian cooking methods are frying, grilling, roasting, dry roasting, sautéing, boiling and steaming. Indonesia is the home of sate; one of the country's most popular dishes, there are many variants across Indonesia. Some popular Indonesian dishes such as nasi goreng, gado-gado, satay, and soto are ubiquitous in the country and are considered national dishes. The official national dish of Indonesia however, is tumpeng, chosen in 2014 by Indonesian Ministry of Tourism and Creative Economy as the dish that binds the diversity of Indonesia's various culinary traditions. However, later in 2018, the same ministry has chosen 5 national dish of Indonesia; they are soto, rendang, satay, nasi goreng, and gado-gado. Today, some popular dishes that originated in Indonesia are now common to neighbouring countries, Malaysia and Singapore. Indonesian dishes such as satay, beef rendang, and sambal are favoured in Malaysia and Singapore. Soy-based dishes, such as variations of tofu and tempeh, are also very popular. Tempeh is regarded as a Javanese invention, a local adaptation of soy-based food fermentation and production. Another fermented food is oncom, similar in some ways to tempeh but using a variety of bases (not only soy), created by different fungi, and particularly popular in West Java. SBS Australia stated that Indonesian food is "one of the most vibrant and colourful cuisines in the world, full of intense flavour." Kira Jane Buxton of Mashed described it as "eclectic" and "diverse". Indonesian cuisine has a long history—although most of them are not well-documented, and relied heavily on local practice and oral traditions. A rare instance however, is demonstrated by Javanese cuisine that somewhat has quite a well-documented culinary tradition. The diversity ranges from ancient bakar batu or stone-grilled yams and boar practiced by Papuan tribes of eastern Indonesia, to sophisticated contemporary Indonesian fusion cuisine. The ethnic diversity of Indonesian archipelago provides an eclectic combination — mixing local Javanese, Sundanese, Balinese, Minang, Malay and other native cuisine traditions, with centuries worth of foreign contacts with Indian traders, Chinese migrants and Dutch colonials. Rice has been an essential staple for Indonesian society, as bas-reliefs of 9th century Borobudur and Prambanan describes rice farming in ancient Java. Ancient dishes were mentioned in many Javanese inscriptions and historians have succeeded in deciphering some of them. The inscriptions from Medang Mataram era circa 8th to 10th century mentioned several ancient dishes, among others are hadaŋan haraŋ (minced water buffalo meat satay, similar with today Balinese sate lilit), hadaŋan madura (water buffalo meat simmered with sweet palm sugar), and dundu puyengan (eel seasoned with lemon basil). Also various haraŋ-haraŋ (grilled meats) either celeṅ/wök (pork), hadahan/kbo (water buffalo), kidaŋ/knas (deer) or wḍus (goat). Ancient beverages include nalaka rasa (sugarcane juice), jati wangi (jasmine beverage), and kinca (tamarind juice). Also various kuluban (boiled vegetables served in spices, similar with today urap) and phalamula (boiled yams and tubers served with liquid palm sugar). Other ancient vegetable dishes include rumwah-rumwah (lalap), dudutan (raw vegetables) and tetis. The 9th century Old Javanese Kakawin Ramayana mentioned cooking technique as Trijata offered Sita some food (canto 17.101); scrumptious food of landuga tatla-tila (cooked with oil) and modakanda sagula (sugared delicacies). Several food were mentioned in several Javanese inscriptions dated from 10th century to 15th century. Some of this dishes are identified with present day Javanese foods. Among others are pecel, pindang, rarawwan (rawon), rurujak (rujak), kurupuk (krupuk), sweets like wajik and dodol, also beverages like dawet. In the 15th century Sundanese manuscript Sanghyang Siksa Kandang Karesian, it was mentioned the common food flavours of that times which includes; lawana (salty), kaduka (hot and spicy), tritka (bitter), amba (sour), kasaya (savoury), and madura (sweet). By the 13th to 15th century, coastal Indonesian polities began to absorb culinary influences from India and the Middle East, as evidence with the adoption of curry-like recipes in the region. This was especially affirmative in the coastal towns of Aceh, Minangkabau lands of West Sumatra, and Malay ports of Sumatra and Malay peninsula. Subsequently, those culinary traditions displayed typical Indian culinary influences, such as kare (curry), roti cane and gulai. This was also went hand in hand with the adoption of Islamic faith, thus encouraged halal Muslim dietary law that omits pork. On the other hand, the indigenous inhabitant that resides inland—such as the Bataks and Dayaks, retains their older Austronesian culinary traditions, which incorporate bushmeat, pork and blood in their daily diet. Indonesian spices (bumbu) including peppercorn, clove, cinnamon and nutmeg. The famed 16th century spice trade has prompted European traders to seek spices' sources as far as Indonesian archipelago. According to the 17th century account of Rijklof van Goens, the ambassador of the VOC for Sultan Agung's Javanese Mataram court,[i] the techniques of meat processing (sheep, goats, and buffalo) during celebration in Java, was by grilling and frying the seasoned meat. However, unlike European, the Javanese only use coconut oil instead of butter. Chinese immigrants has settled in Indonesian archipelago as early as Majapahit period circa 15th century CE, and accelerated during Dutch colonial period. The Chinese settlers introduced stir-frying technique that required the use of Chinese wok and small amount of cooking oil. They also introduced some Chinese foodstuff—including soy sauce,[ii] noodles and soybean processing technique to make tofu. Subsequently, soybean processing led to the possibly accidental discovery of tempeh (fermented soybean cake). The earliest known reference to tempeh appeared in 1815 in the Javanese manuscript of Serat Centhini. The vigor of spice trade during the age of exploration has brought European traders to Indonesian shores. Subsequently, European colonialism was established in the 19th century Dutch East Indies. The influences of European cuisine—most notably the Portuguese and Dutch, has introduced European techniques, especially in bread-making, pastries, cookies and cake-baking. Indonesian culinary tradition has been exposed to various influences. Regarding the method of food processing techniques, each region has developed a specificity that ultimately leads to localization of regional taste. Indonesian typical communal meal, consist of nasi (steamed rice), lauk-pauk (side dishes), and sayur-mayur (vegetables). Indonesian traditional meals usually consists of steamed rice as staple, surrounded by vegetables and soup and meat or fish side dishes. In a typical family meal, the family members gather around the table filled with steamed rice and several other dishes. Each dish is placed in a separate communal large plate or in bowls. Each of these dishes has its own serving spoons, used only to take parts of the dishes from the communal plate into one's own personal plate. Each of the family members has their own personal plate that is first filled with steamed rice. Usually the oldest family member or the husband has the right to initiate the meal, followed by the rest of the family to help themselves with the dishes. Each of them take some portion of dishes from the communal plates into their own individual plates. Nasi goreng-sate combo with egg and krupuk, popular Indonesian dish among foreigners. On their personal plate, the steamed rice will soon be surrounded by two, three or more dishes; vegetables and fish or meat, and maybe some fried dishes, sambal and krupuk. In Indonesian customs — unlike in Japanese counterpart — it is quite acceptable to be seen to mix the different flavoured dishes in a single personal plate during consumption. A practice commonly found in nasi campur, nasi Padang, or during a buffet. The soupy dish however, might be served in a separate small personal bowl. Today in contemporary Indonesian restaurants, the set menu is often offered. This has led to the personal serving practice, in similar fashion to those of Japanese cuisine, with a personal plate on a tray, a rattan or bamboo container each with a separate small portion of dishes surrounding the rice. This can be found in the presentation of nasi Bali. Personal serving of nasi Bali, weaved bamboo plate with rice surrounded by pieces of meat and vegetables side dishes. Indonesian meals are commonly eaten with the combination of a spoon in the right hand and fork in the left hand (to push the food onto the spoon). Unlike European dining custom, knife however, is absent from dining table, thus most of the ingredients such as vegetables and meat are already cut into bite-size pieces prior of cooking. Although, in many parts of the country, such as West Java and West Sumatra, it is also common to eat with one's bare hands. In restaurants or households that commonly use bare hands to eat, such as seafood food stalls, traditional Sundanese and Minangkabau restaurants, or East Javanese pecel lele (fried catfish with sambal) and ayam goreng (fried chicken) food stalls, kobokan is usually served along with the food. Kobokan is a bowl of tap water with a slice of lime in it to give a fresh scent, this bowl of water is not intended for consumption, rather it is used to wash one's hand before and after eating. Eating with chopsticks is generally only found in food stalls or restaurants serving Indonesian adaptations of Chinese cuisine, such as bakmie or mie ayam (chicken noodle) with pangsit (wonton), mie goreng (fried noodles), and kwetiau goreng (fried flat rice noodles). Using water buffalo to plough rice fields in Java; rice is a staple for all classes in contemporary; Indonesia is the world's third largest paddy rice producer and its cultivation has transformed much of Indonesia’s landscape. Rice is a staple for all classes in contemporary Indonesia, and it holds the central place in Indonesian culture: it shapes the landscape; is sold at markets; and is served in most meals both as a savoury and a sweet food. The importance of rice in Indonesian culture is demonstrated through the reverence of Dewi Sri, the rice goddess of ancient Java and Bali. Traditionally the agricultural cycles linked to rice cultivations were celebrated through rituals, such as Seren Taun rice harvest festival. Rice is most often eaten as plain rice with just a few protein and vegetable dishes as side dishes. It is also served, however, as nasi uduk (rice cooked in coconut milk), nasi kuning (rice cooked with coconut milk and turmeric), ketupat (rice steamed in woven packets of coconut fronds), lontong (rice steamed in banana leaves), intip or rengginang (rice crackers), desserts, vermicelli, noodles, arak beras (rice wine), and nasi goreng (fried rice). Nasi goreng is omnipresent in Indonesia and considered as national dish. The ubiquitous nasi goreng (fried rice), considered one of Indonesia's national dishes, it has rich variants, this one uses green stinky bean and goat meat. Rice was only incorporated into diets, however, as either the technology to grow it or the ability to buy it from elsewhere was gained. Evidence of wild rice on the island of Sulawesi dates from 3000 BCE. Evidence for the earliest cultivation, however, comes from the eighth century stone inscriptions from the central island of Java, which shows that kings levied taxes in rice. The images of rice cultivation, rice barns, and pest mice infesting a ricefield is evident in Karmawibhanga bas-reliefs of Borobudur. Divisions of labour between men, women, and animals that are still in place in Indonesian rice cultivation, were carved into relief friezes on the ninth century Prambanan temples in Central Java: a water buffalo attached to a plough; women planting seedlings and pounding grain; and a man carrying sheaves of rice on each end of a pole across his shoulders (pikulan). In the sixteenth century, Europeans visiting the Indonesian islands saw rice as a new prestige food served to the aristocracy during ceremonies and feasts. 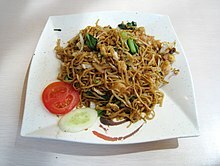 Mie goreng (fried noodle), a wheat-based Chinese dish completely assimilated into Indonesian mainstream cuisine. Wheat is not a native plant to Indonesia, however through imports and foreign influences — most notably Chinese and Dutch — Indonesians began to develop a taste for wheat-based foodstuff, especially Chinese noodles, Indian roti, and Dutch bread. Other than common steamed rice, the Chinese in Indonesia also considered noodles, bakpao and cakwe as staples. Yet in Indonesia, especially in Java and Sumatra, the rice culture was so prevalent that sometimes these wheat-based dishes, such as noodles are treated as side dishes and are consumed with rice, while others such as Chinese buns and cakwe are treated as snacks. The European, especially the Portuguese and the Dutch, introduced bread and various type of bakery and pastry. These European staples have now become alternatives for a quick breakfast. The Indonesian wheat consumption reached a new height after the advent of Indonesian instant noodle industry back in the 1970s. Since then Indonesia has become one of the world's major producers and consumers of instant noodles. Today, instant noodles have become a staple in Indonesian households for quick hot meals. Certain brands such as Indomie have become household names. 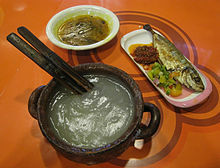 Papeda, staple food of eastern Indonesia, served with yellow soup and grilled mackerel. Other staple foods in Indonesia include a number of starchy tubers such as yam, sweet potato, potato, taro and cassava. Starchy fruit such as breadfruit and jackfruit and grains such as maize are eaten. A sago congee called papeda is a staple food especially in Maluku and Papua. Sago is often mixed with water and cooked as a simple pancake. Next to sago, people of eastern Indonesia consume wild tubers as staple food. Many types of tubers such as talas (a type of taro but larger and more bland) and breadfruit are native to Indonesia, while others were introduced from elsewhere. Yam was introduced from Africa; while potato, sweet potato, cassava and maize were introduced from the Americas through Spanish influence and reached Java in the 17th century. Cassava is usually boiled, steamed, fried or processed as a popular snack kripik singkong (cassava crackers). Dried cassava, locally known as tiwul, is an alternate staple food in arid areas of Java such as Gunung Kidul and Wonogiri, while other roots and tubers are eaten especially in hard times. Maize is eaten in drier regions such as Madura and islands east of the Wallace Line, such as the Lesser Sunda Islands. A number of leaf vegetables are widely used in Indonesian cuisine, such as kangkung, spinach, genjer, melinjo, papaya and cassava leaves. These are often sauteed with garlic. Spinach and corn are used in simple clear watery vegetable soup sayur bayam bening flavoured with temu kunci, garlic and shallot. Clear vegetable soup includes sayur oyong. Other vegetables like calabash, chayote, kelor, yardlong bean, eggplant, gambas and belustru, are cut and used in stir fries, curries and soups like sayur asem, sayur lodeh or laksa. Daun ubi tumbuk is pounded cassava leaves dish, commonly found in Sumatra, Kalimantan and Sulawesi. Sayur sop is cabbage, cauliflower, potato, carrot, with macaroni spiced with black pepper, garlic and shallot in chicken or beef broth. The similar mixed vegetables are also stir fried as cap cai, a popular dish of the Chinese Indonesian cuisine. Tumis kangkung is a popular stir-fried water spinach dish. Vegetables like winged bean, tomato, cucumber and the small variety of bitter melon are commonly eaten raw, like in lalab. The large bitter melon variety is usually boiled. Kecombrang and papaya flower buds are a common Indonesian vegetable. Urap is seasoned and spiced shredded coconut mixed together with vegetables, asinan betawi are preserved vegetables. Gado-gado and pecel are a salad of boiled vegetables dressed in a peanut-based spicy sauce, while karedok is its raw version. Tempe burger, a fusion vegan dish. Vegetarianism is well represented in Indonesia, as there is a wide selection of vegetarian dishes and meat substitutes that may be served. Dishes such as gado-gado, karedok, ketoprak, tauge goreng, pecel, urap, rujak and asinan are vegetarian dishes. However, dishes that use peanut sauce, such as gado-gado, karedok or ketoprak, might contain small amounts of shrimp paste, called "terasi", for flavor. Shrimp paste is also often used to add flavour to spicy sambal chili paste served with lalap assorted fresh vegetables. Fermented soy products, such as tempeh, "tahu" (tofu) and oncom are prevalent as meat substitutes and as a source of vegetable protein. 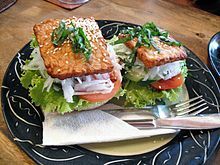 In contemporary fusion cuisine, tempeh is used to replace meat patties and served as tempeh burger. Most Indonesians do not practice strict vegetarianism and may consume vegetables or vegetarian dishes for their taste, preference, economic and health reasons. Nevertheless, there are small numbers of Indonesian Buddhists that practice vegetarianism for religious reasons. The main animal protein sources in the Indonesian diet are mostly poultry and fish, however meats such as beef, water buffalo, goat and mutton are commonly found in the Indonesian marketplaces. Ayam goreng Kalasan, from Kalasan, Yogyakarta. The most common poultry consumed is chicken and duck, however to a lesser amount, pigeon, quail and wild swamp bird such as watercock are also consumed. Traditionally, Indonesians breed free-ranged chicken in the villages known as ayam kampung (village chicken). Compared to common domesticated chicken, these village chicken are thinner and their meat are slightly firmer. Various recipes of ayam goreng (fried chicken) and ayam bakar (grilled chicken) are commonly found throughout Indonesia. Other than frying or grilling, chicken might be cooked as soup, such as sup ayam and soto ayam, or cooked in coconut milk as opor ayam. Chicken satay is also commonly found in Indonesia, it is a barbecued meat on skewer served with peanut sauce. Popular chicken recipes such as ayam goreng kalasan from Yogyakarta, ayam bakar padang from Padang, ayam taliwang from Lombok, ayam betutu from Bali, and ayam goreng lengkuas (galangal fried chicken). Beef and goat meat are the most commonly consumed meats in Indonesia, while kerbau (water buffalo) and domestic sheep are also consumed to a lesser degree, since water buffalo are more useful for ploughing the rice paddies, while sheep are kept for their wool or to be used for the traditional entertainment of ram fighting. As a country with an Islamic majority, Indonesian Muslims follows the Islamic halal dietary law which forbids the consumption of pork. However, in other parts of Indonesia where there are significant numbers of non-Muslims, boar and pork are commonly consumed. Dishes made of non-halal meats can be found in provinces such as Bali, North Sumatra, North Sulawesi, East Nusa Tenggara, Maluku, West Papua, Papua, and also in the Chinatowns of major Indonesian cities. Today to cater for the larger Muslim market, most of the restaurants and eating establishments in Indonesia put halal signs that signify that they serve neither pork nor any non-halal meats, nor do they use lard in their cooking. With an overwhelming Muslim population and a relatively small population of cattle, today Indonesians rely heavily on imported beef from Australia, New Zealand and the United States which often results in a scarcity and raised prices of beef in the Indonesian market. The meat can be cooked in rich spices and coconut milk such as beef, goat or lamb rendang, skewered, seasoned and grilled chicken or mutton as satay, barbecued meats, or sliced and cooked in rich broth soup as soto. Muttons and various offals can be use as ingredients for soto soup or gulai curry. In Bali, with its Hindu majority, the babi guling (pig roast) is popular among locals as well as non-Muslim visitors, while the Batak people of North Sumatra have babi panggang that is a similar dish. Wild boar are also commonly consumed in Papua. The meat also can be processed to be thinly-sliced and dried as dendeng (jerky), or made into abon (meat floss). Dendeng celeng is Indonesian "dried, jerked" boar meat. Raised rabbits are also consumed as food in mountainous region of Indonesia. Some exotic and rare game meat such as venison might be sold and consumed in wilder parts of Indonesia. In West Nusa Tenggara, East Nusa Tenggara, and Papua, deer meat can be found, usually wildly acquired by hunting. Other unusual and often controversial exotic meats include frog legs consumed in Chinese Indonesian cuisine, horse meat consumed in Yogyakarta and West Nusa Tenggara, turtle meat consumed in Bali and Eastern Indonesia, snake, biawak (monitor lizard), paniki (fruit bats), dog meat, and field rats, consumed in Minahasan cuisine of North Sulawesi. Batak cuisine of North Sumatra is also familiar with cooking dog meat. Grilling ikan bakar baronang in Mamuju, West Sulawesi. In an archipelagic nation, seafood is abundant, and it is commonly consumed especially by Indonesian residents in coastal areas. Fish is especially popular in the eastern Indonesian regions of Sulawesi and Maluku, where most of the people work as fishermen. Both areas have a vast sea which brings them many different kinds of seafood. Popular seafood in Indonesian cuisine among others; skipjack tuna, tuna, mackerel, pomfret, wahoo, milkfish, trevally, rabbitfish, garoupa, red snapper, anchovy, swordfish, shark, stingray, squid or cuttlefish, shrimp, crab, blue crab, and mussel. Seafood is commonly consumed across Indonesia, but it is especially popular in Maluku islands and Minahasa (North Sulawesi) cuisine. Seafood are usually being grilled, boiled or fried. Ikan bakar is a popular grilled fish dish that can be found throughout Indonesia. However another method of cooking like stir fried in spices or in soup is also possible. Salted fish is preserved seafood through cured in salt, it is also can be found in Indonesian market. Fresh water fisheries can be found in inland regions or in areas with large rivers or lakes. Fresh water fishes are popular in Sundanese cuisine of West Java, caught or raised in Lake Toba in Batak lands of North Sumatra, or taken from large rivers in Malay lands of Riau, Jambi and South Sumatra, or large rivers in Kalimantan. Popular fresh water fish among others; carp, gourami, catfish, pangasius, snakehead, trichogaster, climbing gourami, Nile tilapia, and Mozambique tilapia. Botok tawon, botok made from bee larvae. Unlike Thailand, in Indonesia insect is not a popular food ingredient nor widely available as street food. In Java, locals do catch, breed and sell certain species of insects, usually sold fresh or alive as pet bird feed. Nevertheless, traditionally several cultures in Indonesia are known to consume insects, especially grasshopper, cricket, termite, also the larvae of sago palm weevil and bee. In Java and Kalimantan, grasshoppers and crickets are usually lightly battered and deep fried in palm oil as crispy kripik snack. Smaller grashoppers, crickets and termites might be made as rempeyek batter cracker which resembles insect fossil. During moonsoon rainy season, flying termites are abundant being attracted to lightbulbs to mate. Locals usually put a bucket of water under the lamp to trap the flying termites, pluck the wings, and roast the termites as additional protein-rich snack. In Banyuwangi, East Java, there is a specialty dish called botok tawon (honeybee botok), which is beehives that contains bee larvae, being seasoned in shredded coconut and spices, wrapped inside banana leaf package and steamed. Dayak tribes of Kalimantan, also Moluccans and Papuan tribes in Eastern Indonesia, are known to consumes ulat sagu (lit. sagoo caterpillar) or larvae of sago palm weevil. This protein-rich larvae is considered as a delicacy in Papua, and often being roasted prior of consumption. However, locals may also commonly eat the larvae raw or alive. "Rempah" is the Indonesian word for spice, while "bumbu" is the Indonesian word for a spice mixture or seasoning, and it commonly appears in the names of certain spice mixtures, sauces and seasoning pastes. Known throughout the world as the "Spice Islands", the Indonesian islands of Maluku contributed to the introduction of its native spices to world cuisine. Spices such as nutmeg or mace, clove, pandan leaves, keluwak and galangal are native to Indonesia. It is likely that black pepper, turmeric, lemongrass, shallot, cinnamon, candlenut, coriander and tamarind were introduced from India, while ginger, scallions and garlic were introduced from China. Those spices from mainland Asia were introduced early, in ancient times, thus they became integral ingredients in Indonesian cuisine. In ancient times, the kingdom of Sunda and the later sultanate of Banten were well known as the world's major producers of black pepper. The maritime empires of Srivijaya and Majapahit also benefited from the lucrative spice trade between the spice islands with China and India. Later the Dutch East India Company controlled the spice trade between Indonesia and the world. Sambal ulek, a common Indonesian spicy condiment. The Indonesian fondness for hot and spicy food was enriched when the Spanish introduced chili pepper from the New World to the region in the 16th century. After that hot and spicy sambals have become an important part of Indonesian cuisine. Indonesia has perhaps the richest variants of sambals. In the Indonesian archipelago, there are as many as 300 varieties of sambal. The intensity ranges from mild to very hot. Sambal evolved into many variants across Indonesia, ones of the most popular is sambal terasi (sambal belacan) and sambal mangga muda (unripe mango sambal). Sambal terasi is a combination of chilies, sharp fermented shrimp paste (terasi), tangy lime juice, sugar and salt all pounded up with mortar and pestle. Dabu-dabu is North Sulawesi style of sambal with chopped fresh tomato, chili, and lime juice. Traditionally prepared laboriously ground upon stone mortar, today sambals is also available as industrial processed products in bottles or jars. Terasi or belacan (shrimp paste) is also an important ingredients for flavouring, usually used in sambal, rujak, or various vegetables dishes. Soy sauce is also an important flavourings in Indonesian cuisine. Kecap asin (salty or common soy sauce) was adopted from Chinese cuisine, however Indonesian developed their own kecap manis (sweet soy sauce) with generous addition of palm sugar into soy sauce. Sweet soy sauce is an important marinade for barbecued meat and fish, such as satay and grilled fishes. Sweet soy sauce is also an important ingredient for semur, Indonesian stew. Peanut sauce is important part of gado-gado. One of the main characteristics of Indonesian cuisine is the wide application of peanuts in many Indonesian signature dishes, such as satay, gado-gado, karedok, ketoprak, and pecel. All of these dishes applied ample of bumbu kacang (peanut sauce) for flavouring. Gado-gado and Satay for example have been considered as Indonesian national dishes. Introduced from Mexico by Portuguese and Spanish merchants in the 16th century, peanuts assumed a place within Indonesian cuisine as a key ingredient. Peanuts thrived in the tropical environment of Southeast Asia, and today they can be found, roasted and chopped finely, in many recipes. Whole, halved, or crushed peanuts are used to garnish a variety of dishes, and used in marinades and dipping sauces such as sambal kacang (a mixture of ground chilies and fried peanuts) for otak-otak or ketan. Peanut oil, extracted from peanuts, is one of the most commonly used cooking oils in Indonesia. Bumbu kacang or peanut sauce represents a sophisticated, earthy seasoning rather than a sweet, gloppy sauce. It should have a delicate balance of savoury, sweet, sour, and spicy flavours, acquired from various ingredients, such as fried peanuts, gula jawa (coconut sugar), garlic, shallots, ginger, tamarind, lemon juice, lemongrass, salt, chilli, peppercorns, sweet soy sauce, ground together and mixed with water to form the right consistency. The secret to good peanut sauce is "not too thick and not too watery." Indonesian peanut sauce tends to be less sweet than the Thai version, which is a hybrid adaptation. Gado-gado is a popular dish particularly associated with bumbu kacang, and is eaten across Indonesia. Shredding coconut flesh to make coconut milk. Coconuts are abundant in tropical Indonesia, and since ancient times Indonesians developed many and various uses for this plant. The broad use of coconut milk in dishes throughout the archipelago is another common characteristic of Indonesian cuisine. It is used in recipes ranging from savoury dishes – such as rendang, soto, gulai, mie koclok, sayur lodeh, gudeg, and opor ayam – to desserts – such as es cendol and es doger. Soto is ubiquitous in Indonesia and considered as one of Indonesia's national dishes. The use of coconut milk is not exclusive to Indonesian cuisine. It can also be found in Indian, Samoan, Thai, Malaysian, Filipino, and Brazilian cuisines. Nonetheless, the use of coconut milk is quite extensive in Indonesia, especially in Minangkabau cuisine, although in Minahasan (North Sulawesi) cuisine, coconut milk is generally absent, except in Minahasan cakes and desserts such as klappertart. In Indonesian cuisine, two types of coconut milk are found, thin coconut milk and thick coconut milk. The difference depends on the water and oil content. Thin coconut milk is usually used for soups such as sayur lodeh and soto, while the thicker variety is used for rendang and desserts. It can be made from freshly shredded coconut meat in traditional markets, or can be found processed in cartons at the supermarket. After the milk has been extracted from the shredded coconut flesh to make coconut milk, the ampas kelapa (leftover coconut flesh) can still be used in urap, seasoned and spiced shredded coconut meat mixed together with vegetables. Leftover shredded coconut can also be cooked, sauteed and seasoned to make serundeng, almost powdery sweet and spicy finely shredded coconut. Kerisik paste, added to thicken rendang, is another use of coconut flesh. To acquire a rich taste, some households insist on using freshly shredded coconut, instead of leftover, for urap and serundeng. Serundeng can be mixed with meat in dishes such as serundeng daging (beef serundeng) or sprinkled on top of other dishes such as soto or ketan (sticky rice). An example of the heavy use of coconut is Burasa from Makassar, rice wrapped in banana leaf cooked with coconut milk and sprinkled with powdered coconut similar to serundeng. A traditional humble kitchen in Indonesia using firewood for cooking. Most of the common Indonesian dishes are named according to their main ingredients and cooking method. For example, ayam goreng is ayam (chicken) and goreng (frying), which denotes fried chicken. Mie goreng is fried noodle, ikan bakar is grilled fish, udang rebus is boiled shrimp, babi panggang is roasted pork and tumis kangkung is stir fried water spinach. Cooking methods in Indonesian kitchen are goreng (frying) either in a small amount of oil or deep frying with a lot of cooking oil, tumis (stir frying), sangray (sautéing). Roasting methods are bakar (grilling) usually employing charcoal, firewood, or coconut shell, panggang (baked) usually refer to baking employing oven. Other methods are rebus (boiling) and kukus (steaming). 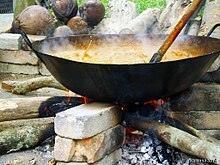 The fire used in cooking can be either strong fire or small fire for slow cooking. Cooking nasi goreng usually employs strong fire, while authentic rendang for example requires small fire for slow cooking of beef, spices, and coconut milk until the meat is caramelised and all the coconut milk's liquid has evaporated. Traditional Indonesian dapur (kitchen) usually employs firewood-fuelled kitchen stove, while the contemporary household today uses liquefied petroleum gas-fuelled stove or an electric stove. The ingredients could be cut in pieces, sliced thinly, or ground into a paste. Cooking utensils are wajan (wok), penggorengan (frying pan), panci (cauldron), knives, several types of spoon and fork, parutan (shredder), cobek and ulekan (stone mortar and pestle). Traditionally Indonesians use a stone mortar and a pestle to grind the spices and ingredients into coarse or fine pastes. Today most households use blender or food processor for the task. Traditional Indonesian cookingwares are usually made from stone, earthenware pottery, wood, and woven bamboo or a rattan container or filter, while contemporary cookingwares, plates and containers use metals – iron, tin, stainless steel, aluminium, ceramics, plastics, and also glass. Diverse and eclectic, Betawi cuisine of Jakarta draw culinary influences from Chinese, Malay, Sundanese, to Arab, Indian and European. Popular Betawi dishes include nasi uduk (coconut rice), sayur asem (sweet and sour vegetable soup), asinan (salad of pickled vegetables), gado-gado, (boiled or blanched vegetables salad in peanut sauce), ketoprak, (vegetables, tofu, rice vermicelli and rice cake in peanut sauce), and kerak telor (spiced coconut omelette). Born from a creole or hybrid phenomena, the Betawi cuisine is quite similar to the Peranakan cuisine. Examples of Sundanese cuisine; rich in fresh vegetables and adoring salted fish. A textural speciality of Sunda (West Java) is karedok, a fresh salad made with long beans, bean sprouts, and cucumber with a spicy peanut sauce. Lalab fresh vegetables served with spicy sambal dipping sauce is ubiquitous in Sundanese households and eating establishments. Other Sundanese dishes include mie kocok which is a beef and egg noodle soup, and Soto Bandung, a beef and vegetable soup with daikon and lemon grass. A hawker favourite is kupat tahu (pressed rice, bean sprouts, and tofu with soy and peanut sauce). Colenak (roasted fermented cassava tapai with sweet coconut sauce) and ulen (roasted brick of sticky rice with peanut sauce) are dishes usually eaten warm. The food of Central Java is renowned for its sweetness, and the dish of gudeg, a curry made from jackfruit, is a particularly sweet. The city of Yogyakarta is renowned for its ayam goreng (fried chicken) and klepon (green rice-flour balls with palm sugar filling). Surakarta's (Solo) specialities include Nasi liwet (rice with coconut milk, unripe papaya, garlic and shallots, served with chicken or egg) and serabi (coconut milk pancakes topped with chocolate, banana or jackfruit). Other Central Javanese specialities pecel (peanut sauce with spinach and bean sprouts), lotek (peanut sauce with vegetable and pressed rice), and opor ayam (braised chicken in coconut sauce). The food of East Java is similar to that of Central Java. East Java foods tend to be less sweet and spicier compare to the Central Javan ones. Fish and fish/seafood products are quite extensively, e.g. terasi (dried shrimp paste) and petis udang (shrimp paste). Some of the more popular foods are lontong kupang (tiny clams soup with rice cakes), lontong balap (bean sprouts and tofu with rice cakes), sate klopo (coconut beef satay), semanggi surabaya (marsilea leaves with spicy sweet potato sauce), pecel lele (deep fried catfish served with rice and sambal), rawon (dark beef soup). Food from Malang includes bakwan Malang (meatball soup with won ton and noodles) and arem-arem (pressed rice, tempe, sprouts, soy sauce, coconut, and peanuts). Madura is an island on the northeastern coast of Java and is administered as part of the East Java province. Like the East Java foods which use petis udang, Madura foods add petis ikan which is made from fish instead of shrimp. 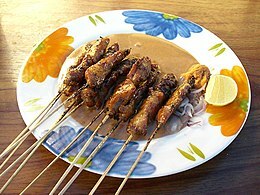 The Madura style satay is probably the most popular satay variants in Indonesia. Some of its popular dishes are sate ayam Madura (chicken satay with peanut sauce), soto Madura (beef soup). There is also a mutton variant of Madura satay, sate kambing Madura. Sup Kambing mutton soup is also popular in Madura. As a leading salt production center in Indonesian archipelago, Madura dishes are often saltier compared to other East Javanese foods. Balinese cuisine dishes include lawar (chopped coconut, garlic, chilli, with pork or chicken meat and blood). Bebek betutu is duck stuffed with spices, wrapped in banana leaves and coconut husks cooked in a pit of embers. Balinese sate, known as sate lilit, is made from spiced mince pressed onto skewers which are often made from lemon grass sticks. Babi guling is a spit-roasted pig stuffed with chilli, turmeric, garlic, and ginger. Basa gede or basa rajang is a spice paste that is a basic ingredient in many Balinese dishes. Arab, Persian, and Indian traders influenced food in Aceh although flavours have changed a lot their original forms. Amongst these are curry dishes known as kare or gulai, which are rich, coconut-based dishes traditionally made with beef, goat, fish or poultry, but are now also made with tofu, vegetables, and jackfruit. The popular Aceh food such as roti cane, mie aceh and nasi gurih. Batak dishes, saksang, babi panggang and daun ubi tumbuk. Batak people use either pork or even dog to make saksang. Another Batak pork speciality is babi panggang in which the meat is boiled in vinegar and pig blood before being roasted. Another batak dish, Ayam namargota, is chicken cooked in spices and blood. Another notable Batak dish is arsik, the carp fish cooked with spices and herbs. Lada rimba is strong pepper used by Bataks. The hidang style Padang food served at Sederhana restaurant, all of the bowls of food are laid out in front of customer, the customer only pays for whichever bowl they eat from. Buffaloes are a symbol of West Sumatra and are used in rendang, a rich and spicy buffalo meat or beef dish, which is also the signature dish of Minangkabau culture. Padang food comes from West Sumatra, and they have perhaps the richest variants of gulai, a type of curried meat, offal, fish or vegetables. Padang favourite includes asam padeh (sour and spicy fish stew), sate Padang (Padang satay), soto Padang (Padang soto) and katupek sayua (ketupat rice dumpling in vegetable soup). Dishes from the region include nasi kapau from Bukittinggi, which is similar to Padang food but uses more vegetables. Ampiang dadiah (buffalo yogurt with palm sugar syrup, coconut flesh and rice) and bubur kampiun (Mung bean porridge with banana and rice yogurt) are other West Sumatran specialties. Traditionally, Minangkabau people adheres to merantau (migrating) culture, and they are avid restaurant entrepreneurs. As a result, Padang food restaurant chains can be found throughout Indonesia and neighbouring countries, likely making it the most popular regional dish in Indonesia. In outside West Sumatra such as in Java, most of Padang Restaurants still use buffalo to make rendang, but claim as Rendang Sapi for selling purposes due to buffalo meat is more inferior and cheaper than cow meat. 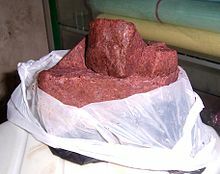 Buffalo meat is harder, so suitable for rendang with cooking time at least 3 hours, the texture is also coarse and the color is more red than cow meat even when is already cooked. Gulai ikan kerapu, grouper curry. The cuisine of east coast of Sumatra is referring to the culinary tradition of ethnic Malays of Indonesian Sumatran provinces facing Malacca strait; which includes Riau, Riau Islands, Jambi provinces and coastal North Sumatra in Melayu Deli areas in and around Medan. Because of close ethnic kinship and proximity to Malaysian Malays, many dishes are shared between the two countries. For example nasi lemak, the national dish of Malaysia, and also nasi ulam are considered as native dishes in Riau and Jambi. 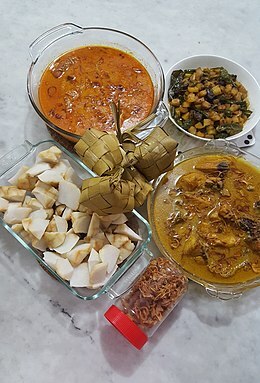 Malay cuisine also shares many similarities with neighboring Minangkabau cuisine of West Sumatra, South Sumatra, and also Aceh; such as sharing gulai, asam pedas, pindang, kari, lemang and rendang. This is due to the fact that the Minangkabau are culturally closely related to the Malays. Tempoyak fermented durian sauce and sambal belacan are the familiar condiments in both Sumatra and Malay Peninsula. Variants of peranakan cuisine such as laksa spicy noodle and otak-otak are also can be found in Riau Islands and Medan. Seafood dishes are popular in archipelagic Riau Islands province, while fresh water fishes from Sumatran rivers, such as patin, catfish, carp and gourami are popular in Riau and Jambi. Gulai ikan patin is a signature dish of Pekanbaru, while gulai ketam (crab gulai) and nasi goreng teri Medan (Medan anchovy fried rice) are the signature dishes of Medan. Tempoyak ikan patin a Palembang dish of pangasius fish in fermented durian sauce. The city of Palembang is the culinary centre of South Sumatra and is renowned for its pempek, a deep fried fish and sago dumpling that is also known as empek-empek. Pempek is served in distinctive kuah cuko, a sweet, sour and spicy sauce made from palm sugar, chili, tamarind and vinegar. Pempek derivatives dishes are tekwan soup of pempek dumpling, mushroom, vegetables, and shrimp, lenggang or pempek slices in omelette. Mie celor is a noodle dish with egg in coconut milk and dried shrimp, it is a Palembang speciality. The cuisine of Palembang demonstrate various influences, from native Palembang Malay taste to Chinese and Javanese influences. Pempek is said to be the influence of Chinese fish cake akin to surimi, while the preference of mild sweetness is said to be of Javanese influence. South Sumatra is home to pindang, a sweet, sour and spicy fish soup made from soy sauce and tamarind. Pindang dishes usually uses either fresh water fishes and seafood as ingredients. Ikan brengkes is fish in a spicy durian-based sauce. Tempoyak is a sauce of shrimp paste, lime juice, chilli and fermented durian, and sambal buah is a chili sauce made from fruit. Manado cuisine of Minahasan people from North Sulawesi features the heavy use of meat such as pork, fowl, and seafood. "Woku" is a type of seafood dish with generous use of spices, often making up half the dish. The ingredients include lemongrass, lime leaves, chili peppers, spring onion, shallots, either sautéed with meat or wrapped around fish and grilled covered in banana leaves. Other ingredients such as turmeric and ginger are often added to create a version of woku. Other Minahasan signature dishes are tinutuan, chicken tuturuga, rica-rica and cakalang fufu. Foreign colonial influence played a role in shaping Minahasan cuisine. Brenebon (from Dutch "bruin" (brown) and "boon" (bean)) is a pork shank bean stew spiced with nutmeg and clove. Minahasan roast pork similar to lechon in the Philippines or pig roast in Hawaii are served in special occasions, especially weddings. Other unusual and exotic meats such as dog, bat, and forest rat are regularly served in North Sulawesi region. Paniki is the bat dish of Minahasa. Sop saudara and ikan bolu bakar (grilled milkfish). Specialty of Makassar. Makassar is one the culinary centres in Indonesia. Home of some Bugis and Makassar delicacies such as Coto, Konro, Pallubasa and Mie Kering. All of these Makassar foods are usually consumed with burasa, a coconut milk rice dumpling wrapped in a banana leaf, to replace steamed rice or ketupat. As a big fish market centre, Makassar is also famous for its seafood. Various ikan bakar or grilled fish are popular and commonly served in Makassar restaurants, warung and foodstalls, such as ikan bolu bakar (grilled milkfish). Sop saudara from Pangkep and Kapurung from Palopo are also famous dishes of South Sulawesi. Another popular cuisine from Makassar is Ayam Goreng Sulawesi (Celebes fried chicken); the chicken is marinated in a traditional soy sauce for up to 24 hours before being fried into a golden colour. The dish is usually served with chicken broth, rice and special sambal (chilli sauce). In addition, Makassar is also home of traditional sweet snacks such as pisang epe (pressed banana), as well as pisang ijo (green banana). Pisang Epe is a flat-grilled banana which is pressed, grilled, and covered with palm sugar sauce and sometimes eaten with durian. Many street vendors sell pisang epe, especially around the area of Losari beach. Pisang ijo is a banana covered with green colored flours, coconut milk, and syrup. Pisang ijo is sometimes served iced, and often sold and consumed as iftar to break the fast during Ramadhan. Se'i babi, smoked pork from Kupang, West Timor, East Nusa Tenggara. With a drier climate in Nusa Tenggara archipelago, there is less rice and more sago, corn, cassava, and taro compared to central and western Indonesia. Fishes are popularly consumed, including sepat (Trichogaster), which is shredded fish in coconut and young-mango sauce. Lombok's sasak people enjoy spicy food such as ayam taliwang which is roasted chicken served with peanut, tomato chilli and lime dip. Pelecing is a spicy sauce used in many dishes made with chilli, shrimp paste, and tomato. 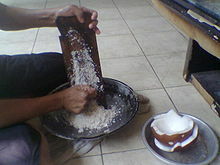 A local shrimp paste called lengkare is used on the island of Lombok. Sares is made from chilli, coconut juice and banana palm pith and is sometimes mixed with meat. Non meat dishes include kelor (hot soup with vegetables), serebuk (vegetables mixed with coconut), and timun urap (cucumber with coconut, onion and garlic). In East Nusa Tenggara, majority of its inhabitants are Catholics, hence pork is commonly consumed. Popular Timor dishes are Se'i smoked meat (usually pork), and katemak vegetable soup. The Maluku Islands' cuisine is rich with seafood, while the native Papuan food usually consists of roasted boar with tubers such as sweet potato. Various types of ikan bakar (grilled fish) or seafood are eaten with spicy colo-colo condiment. The staple food of Maluku and Papua is sago, either as a pancake or sago congee called papeda, usually eaten with yellow soup made from tuna, red snapper or other fishes spiced with turmeric, lime, and other spices. Martabak telur, a savoury egg, leek and meat omelette. Indian influence can be observed in Indonesia as early as the 4th century. Following the spread of Islam to Indonesia, Muslim Indian as well as Arab influences made their way into Indonesian cuisine. Examples include Indian martabak and kari (curry) that influenced Sumatran cuisines of Aceh, Minangkabau, and Malay; in addition to Betawi and coastal Javanese cuisine. Some of Aceh and Minangkabau dishes such as roti cane, nasi biryani, nasi kebuli, and gulai kambing can trace its origin to Indian influences. Siomay, popular Indonesian Chinese-influenced dish. Chinese immigration to Indonesia started in the 7th century, and accelerated during Dutch colonial times, thus creating the fusion of Chinese cuisine with indigenous Indonesian style. Similar Chinese-native fusion cuisine phenomena is also observable in neighbouring Malaysia and Singapore as peranakan cuisine. Some popular Indonesian dishes trace its origin to Chinese influences such as; bakmi, bakso, soto mie, soto, bakpau, nasi goreng, mi goreng, tahu goreng, siomay, pempek, lumpia, nasi tim, cap cai, fu yung hai and swikee. Some of this Chinese-influenced dishes has been so well-integrated into Indonesian mainstream cuisine that many Indonesian today might not recognise their Chinese-origin and considered them as their own. Selat solo (solo salad), an adaptation of European cuisine into Javanese taste. The Dutch arrived in Indonesia in the 16th century in search of spices. When the Dutch East India Company (VOC) went bankrupt in 1800, Indonesia became a treasured colony of the Netherlands. Through colonialism, Europeans introduced bread, cheese, barbecued steak and pancake. Bread, butter and margarine, sandwiches filled with ham, cheese or fruit jam, poffertjes, pannekoek and Dutch cheeses are commonly consumed by colonial Dutch and Indos during the colonial era. Some of native upperclass ningrat (nobles) and educated native were exposed to European cuisine; This cuisine was held in high esteem as the cuisine of the upper class of Dutch East Indies society. This led to adoption and fusion of European cuisine into Indonesian cuisine. Some dishes created during the colonial era were influenced by Dutch cuisine, including roti bakar (grilled bread), roti buaya, selat solo (solo salad), bistik jawa (Javanese beef steak), semur (from Dutch smoor), sayur kacang merah (brenebon) and sop buntut. Many pastries, cakes and cookies such as kue bolu (tart), lapis legit (spekkoek), spiku (lapis Surabaya) and kaasstengels (cheese cookies) come from Dutch influence. Some recipes were invented as Dutch Indies fusion cuisine, using native ingredients but employing European pastry techniques. These include pandan cake and klappertaart (coconut tart). Kue cubit, commonly sold as a snack at schools and marketplaces, are believed to be derived from poffertjes. Conversely, Indonesian cuisine also had influenced the Dutch through their shared colonial heritage. Indonesian cuisine also influencing neighbouring countries through Indonesians migration across the straits to Malaysia. Beef rendang with ketupat palas served in Malaysia. Because of their proximity, historic migrations and close cultural kinship, Indonesian cuisine also has influenced neighbouring cooking traditions; most notably Malaysian cuisine. Indonesian influence is pervasive in the central state of Negeri Sembilan, which was settled largely by Minangkabau people hailing from West Sumatra and is, thus, reflected in their culture, history and cuisine. Minangkabau cuisine influences is profound in Malay cooking tradition, as the result both traditions share same dishes; including rendang, gulai, asam pedas and tempoyak. Rendang is a typical example that has been well-integrated into mainstream Malaysian cuisine and is now considered as their own, and popular especially during Hari Raya Aidil Fitri. In the early 20th century, there are large influx of Sumatrans to Kuala Lumpur and other parts of Malaysia heartland, that led to the popularity of Nasi Padang (originated from Padang city, West Sumatra) not only in Malaysia, but also in Singapore. The Malay cuisine of southernmost state of Johor, reflects the influences of Javanese who settled there for over past two centuries. Popular Javanese-origin dishes in Johor includes ayam penyet, nasi ambeng, telur pindang, sayur lodeh, mee rebus and pechal. To a lesser extent, Indonesian cuisine also had influenced Thai cuisine — probably through Malaysian intermediary — such as the introduction of satay, from Java to Sumatra, Malay Peninsula, and reached Thailand. Achat (Thai: อาจาด pronounced [ʔāː.t͡ɕàːt]), is a Thai pickles which believed to be derived from Indonesian acar. It is made with cucumber, red chilies, red onions or shallots, vinegar, sugar and salt. It is served as a side dish with the Thai version of satay (Thai: สะเต๊ะ). Kipsate met friet, Dutch take on Indonesian chicken satay, served with Peanut sauce, fried onions, kroepoek, friet, and mayonnaise. During the colonial period, the Dutch embraced Indonesian cuisine both at home and abroad. The Indonesian cuisine had influenced colonial Dutch and Indo people that brought Indonesian dishes back to the Netherlands due to repatriation following the independence of Indonesia. C. Countess van Limburg Stirum writes in her book "The Art of Dutch Cooking" (1962): There exist countless Indonesian dishes, some of which take hours to prepare; but a few easy ones have become so popular that they can be regarded as "national dishes". She then provides recipes for nasi goreng (fried rice), pisang goreng (battered, deep fried bananas), lumpia goreng (fried spring rolls), bami (fried noodles), satay (grilled skewered meat), satay sauce (peanut sauce), and sambal oelek (chilli paste). Dutch-Indonesian fusion dishes also exist, of which the most well-known is the rijsttafel ("rice table"), which is an elaborate meal consisting of many (up to several dozens) small dishes (hence filling "an entire table"). While popular in the Netherlands, Rijsttafel is now rare in Indonesia itself. Today, there are many Indonesian restaurants in the Netherlands, especially in large cities like Amsterdam, Den Haag, Utrecht and Rotterdam. 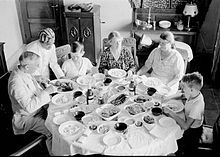 Traditional slametan meal in Java during colonial period. Indonesians might consumes snacks or varieties of small dishes throughout the day. However, if separate scheduled larger meal is observed, they usually consists of sarapan or makan pagi (breakfast), makan siang (lunch) is often the main meal of the day, followed by makan malam (dinner). Mealtime is typically a casual and solitary affair, and might be observed differently across region. In western and central Indonesia, the main meal is usually cooked in the late morning, and consumed around midday. In many families there is no set meal time when all members are expected to attend. For this reason, most of the dishes are made so that they can remain edible even if left on the table at room temperature for many hours. The same dishes are then re-heated for the final meal in the evening. Most meals are built around a cone-shaped pile of long-grain, highly polished rice. A meal may include a soup, salad (or more commonly vegetables sautéed with garlic), and another main dish. Whatever the meal, it is accompanied by at least one, and often several, relishes called sambals. Especially for Javanese family, on the table, it is also common to always have chips, that can be kerupuk, rempeyek, or any other chips to accompany the meal. In eastern Indonesia, such as on the islands of Papua and Timor, where the climate is often much drier, the meals can be centred around other sources of carbohydrates such as sago or root vegetables and starchy tubers. Being east of the Wallace line, the ecozone, and hence the flora and fauna, are quite different from those of the islands to the west, and so the food stuffs are, as well. Tumpeng nasi kuning, the cone shaped yellow rice is served during a feast. Many Indonesian traditional customs and ceremonies incorporate food and feast, one of the best examples is tumpeng. Originally from Java, tumpeng is a cone shaped mound of rice surrounded by an assortment of other dishes, officially chosen as Indonesian national dish in 2014. Traditionally featured in slametan ceremonies, the cone of rice is made by using bamboo leaves woven into a cone-shaped container. The rice itself can be plain white steamed rice, uduk (rice cooked with coconut milk), or yellow rice (rice coloured with kunyit, i.e., turmeric). After it is shaped, the rice cone is surrounded by assorted dishes, such as urap vegetables, fried chicken, semur (beef in sweet soy sauce), teri kacang (little dried fish fried with peanuts), fried prawns, telur pindang (marblised boiled eggs), shredded omelette, tempe orek (sweet, dry fried tempeh), perkedel kentang (mashed potato fritters), perkedel jagung (corn fritters), sambal goreng ati (liver in chilli sauce), and many other dishes. Nasi tumpeng probably comes from an ancient Indonesian tradition that revers mountains as the abode of the ancestors and the gods. Rice cone is meant to symbolise the holy mountain. The feast served as some kind of thanksgiving for the abundance of harvest or any other blessings. Because of its festivities and celebratory value, even now tumpeng is sometimes used as an Indonesian counterpart to birthday cake. Hidang presentation of nasi padang. Having Nasi Padang in festive hidang (serve) style provides opportunity to sample wide array of Padang food in a single setting. Nasi Padang (Padang-style rice) is the steamed rice served with various choices of pre-cooked dishes originated from Padang city, West Sumatra. It is a miniature banquet of meats, fish, vegetables, and spicy sambals eaten with plain white rice. It is the Minangkabau's great contribution to Indonesian cuisine. After the customers are seated, they do not have to order. The waiter with stacked plates upon their hands will immediately serves the dishes directly to the table. The table will quickly be set with dozens of small dishes filled with richly flavoured foods such as beef rendang, various gulais, curried fish, stewed greens, chili eggplant, curried beef liver, tripe, intestines, or foot tendons, fried beef lung, fried chicken, and of course, sambal. A dozen of dishes is a normal number, it could reach 14 dishes or more. Nasi Padang is an at-your-table, by-the-plate buffet. Customers take — and pay for — only what they have consumed from this array. Rijsttafel in 1936 Dutch East Indies. Another Indonesian feast, the Rijsttafel (from Dutch, meaning 'rice table'), demonstrates both colonial opulence and the diversity of Indonesian cuisine at the same time. The classic style rijsttafel involved serving of up to 40 different dishes by 40 male waiters, bare foot but dressed in formal white uniforms with blangkon (traditional Javanese caps) on their heads and batik cloth around their waists. In contemporary Indonesian cuisine, it has been adapted into a western style prasmanan buffet. Prasmanan, an Indonesian style buffet. When attending the reception of an Indonesian traditional wedding party, office lunch-time meeting, a seminar or dinner gathering, one usually will find themselves queuing to Indonesian prasmanan; a long table filled with wide array of Indonesian dishes. A prasmanan is quite similar with rijsttafel but minus the ceremonial waiters and usually served fewer choices of dishes compared to its flamboyant colonial predecessor. It is an Indonesian buffet as it employs a long table with a wide range of dishes, both savoury and sweet, served on it. It can usually be found in wedding ceremonies or any other festivities. The layout for an Indonesian wedding ceremony buffet is usually: plates, eating utensils (spoon and fork), and paper napkins placed on one end, followed by rice (plain or fried), a series of Indonesian (and sometimes international) dishes, sambal and krupuk (shrimp crackers), and ending with glasses of water on the other end of the table. The most common and popular Indonesian drinks and beverages are teh (tea) and kopi (coffee). Indonesian households commonly serve teh manis (sweet tea) or kopi tubruk (coffee mixed with sugar and hot water and poured straight in the glass without separating out the coffee residue) to guests. Since the colonial era of Netherlands East Indies, plantations, especially in Java, were major producers of coffee, tea and sugar. Since then hot and sweet coffee and tea beverages have been enjoyed by Indonesians. Jasmine tea is the most popular tea variety drunk in Indonesia, however recent health awareness promotions have made green tea a popular choice. Usually coffee and tea are served hot, but cold iced sweet tea is also frequently drunk. Kopi Luwak is Indonesian exotic and expensive coffee beverage made from the beans of coffee berries which have been eaten by the Asian palm civet (Paradoxurus hermaphroditus) and other related civets. Teh botol, bottled sweet jasmine tea, is now quite popular and locally competes favourably with international bottled soda beverages such as Coca-Cola and Fanta. Kopi susu (coffee with sweetened condensed milk) is an Indonesian version of Café au lait. Es kelapa muda or young coconut ice is fresh drink which is made from chilled young coconut water, coconut flesh and syrup. It is among favourite beverage in Indonesia. Fruit juices (jus) are very popular. Varieties include orange (jus jeruk), guava (jus jambu), mango (jus mangga), soursop (jus sirsak) and avocado (jus alpokat), the last of these being commonly served with condensed milk and chocolate syrup as a dessert-like treat. Durian can be made into ice cream called es durian. Indonesian dessert es teler, consisting of avocado, jackfruit, and young coconut in shredded ice and condensed milk. Many popular drinks are based on ice (es) and can also be classified as desserts. Typical examples include young coconut (es kelapa muda), grass jelly (es cincau), cendol (es cendol or es dawet), avocado, jackfruit and coconut with shreded ice and condensed milk (es teler), mixed ice (es campur), kidney beans (es kacang merah), musk melon (es blewah), and seaweed (es rumput laut). Hot sweet beverages can also be found, such as bajigur and bandrek which are particularly popular in West Java. Both are coconut milk or coconut sugar (gula jawa) based hot drinks, mixed with other spices. Sekoteng, a ginger based hot drink which includes peanuts, diced bread, and pacar cina, can be found in Jakarta and West Java. Wedang jahe (hot ginger drink) and wedang ronde (a hot drink with sweet potato balls) are particularly popular in Yogyakarta, Central Java, and East Java. Balinese brem with 5% alcohol content. As a Muslim-majority country, Indonesian Muslims share Islamic dietary laws that prohibit alcoholic beverages. However, since ancient times, local alcoholic beverages were developed in the archipelago. According to a Chinese source, people of ancient Java drank wine made from palm sap called tuak (palm wine). Today tuak continues to be popular in the Batak region, North Sumatra. A traditional Batak bar serving tuak is called lapo tuak. In Solo, Central Java, ciu (a local adaptation of Chinese wine) is known. Bottled brem bali (Balinese rice wine) is popular in Bali. In Nusa Tenggara and Maluku Islands the people also drink palm wine, locally known as sopi. In the Minahasa region of North Sulawesi, the people drink a highly alcoholic drink called Cap Tikus. Indonesians developed local brands of beer, such as Bintang Beer and Anker Beer. In Indonesia, dishes are served from a fine dining restaurant in five-star hotel, a simple restaurant downtown, humble street side warung under the tent, to street hawker peddling their gerobak (cart) or pikulan (carrying using rod). Floating warung boat attached to the bank of Musi river, Palembang, selling local favourite such as pempek. In Indonesia rumah makan means restaurant, while warung means small and humble shop. From these eating establishments, a warteg (warung Tegal) and rumah makan Padang are particularly notable for their ubiquitousness in Indonesian cities and towns. A warteg or warung tegal is a more specific warung nasi, established by Javanese people from the town Tegal in Central Java. They sells favourite Javanese dishes and rice, the wide array of pre-cooked dishes are arranged in glass windowed cupboard. They are well known on selling modestly-priced meals, popular among working class such as low-skilled labours in the cities. While rumah makan Padang is a Padang restaurant, a smaller scale Padang eateries might be called warung Padang. Most of Indonesian restaurants are based upon specific regional cuisine tradition. For example, rumah makan Padang are definitely Minangkabau cuisine. Sundanese saung restaurant or colloquically called as kuring restaurants are selling Sundanese dishes. This includes Bataks' lapo, Manado and Balinese restaurants. While other restaurants might specifically featuring their best specific dishes, for example Ayam goreng Mbok Berek, Bakmi Gajah Mada, Satay Senayan, Rawon Setan Surabaya, Pempek Pak Raden, etc. Indonesian street food are usually cheap, offer a great variety of food of different tastes, and can be found on every corner of the city. Street and street-side vendors are common, in addition to hawkers peddling their goods on bicycles or carts. These carts are known as pedagang kaki lima. These food hawkers on carts or bicycles might be travelling on streets, approaching potential buyers through residential areas whilst announcing their presence, or stationing themselves on a packed and busy street side, setting simple seating under a small tent and waiting for customers. Many of these have their own distinctive call, tune, or noise to announce their presence. For example, bakso sellers will hit the side of a soup bowl using a spoon, whereas nasi goreng sellers announce themselves by hitting their wok. In most cities, it is common to see Chinese dishes such as bakpao (steamed buns with sweet and savoury fillings), bakmie (noodles), and bakso (meatballs) sold by street vendors and restaurants, often adapted to become Indonesian-Chinese cuisine. One common adaptation is that pork is rarely used since the majority of Indonesians are Muslims. Other popular Indonesian street food and snacks are siomay and batagor (abbreviated from Bakso Tahu Goreng), pempek (deep fried fish cake), bubur ayam (chicken congee), bubur kacang hijau (mung beans porridge), satay, nasi goreng (English: fried rice), soto mie (soto noodle), mie ayam (chicken noodle) and mie goreng (fried noodle), taoge goreng (mung bean sprouts and noodle salad), asinan (preserved vegetables or fruits salad), laksa, kerak telor (spicy omelette), gorengan (Indonesian assorted fritters) and Bakwan (fried dish of beansprouts and batter). Indonesian street snacks include iced and sweet beverages, such as es cendol or es dawet, es teler, es cincau, es doger, es campur, es potong, and es puter. Indonesian cakes and cookies are often called jajanan pasar (market munchies). Selection of tropical fruits sold in Bali. Indonesian markets abound with many types of tropical fruit. These are an important part of the Indonesian diet, either eaten freshly, or made into juices (such as jus alpukat), desserts (such as es buah and es teler), processed in savoury and spicy dishes like rujak, fried like pisang goreng (fried banana), cooked into cakes (such as kue pisang or bika ambon), sweetened and preserved such as sale pisang and manisan buah, or processed into kripik (crispy chips) as snacks like jackfruit or banana chips. Fruit rujak, consists of slices of unripe mango, jambu air, kedondong, jicama, papaya and pineapple. These fruits are served with thick and spicy coconut sugar and spicy salt. Many of these tropical fruits such as mangga (mango), manggis (mangosteen), rambutan, cempedak, nangka (jackfruit), durian, jambu air, duku (langsat), jeruk bali (pomelo), belimbing (carambola), kedondong and pisang (banana), are indigenous to Indonesian archipelago; while others have been imported from other tropical countries, although the origin of many of these fruits might be disputed. Klengkeng (longan) were introduced from India, semangka (watermelon) from Africa, kesemek from China, while alpukat (avocado), sawo, markisa (passionfruit), sirsak (soursop), nanas (pineapple), jambu biji (guava) and pepaya (papaya) were introduced from the Americas. Many of these tropical fruits are seasonally available, according to each species flowering and fruiting seasons. While certain fruits such as banana, watermelon, pineapple and papaya are available all year round. Today, Indonesian markets is also enrichen with selections of home-grown non-tropical fruits that is not native to Indonesia. Strawberry, melon, apple, pear and dragonfruit are introduced and grown in cooler Indonesian highlands such as Malang in mountainous East Java, Puncak and Lembang near Bandung, to mimic their native subtropics habitat. Rambutan for sale at a market in Jakarta. In the last few years, fruit chips have been more and more various. In the old times, banana and jackfruit chips were the most common, but now Indonesian fruit chips are also made from strawberry, apple, dragonfruit, pepino, watermelon, melon, more. Malang, a city in East Java, is the centre of fruit chip production aside from tempeh chips. Banana and coconut are particularly important, not only to Indonesian cuisine, but also in other uses, such as timber, bedding, roofing, oil, plates and packaging. Banana leaf and janur (young coconut leaf) are particularly important for packaging and cooking process, employed to make pepes, lontong and ketupat. Much carbohydrate intake in Indonesian cuisine comes from rice, while in eastern parts of Indonesia, yam and sago are common. Indonesian protein intake comes from soy bean products that are processed into tofu and tempeh. Chicken eggs, poultry and meats are also consumed. Most of the fat intake comes from cooking oil (coconut oil) of fried dishes, coconut milk, peanuts, as well as meats and offals. However, according to a WHO nutrition study, compared to global diet average, Indonesians consumes less protein, vegetables and fruits. Which means most of Indonesian diet consist heavily of carbohydrate, which is mostly contributed by high consumption of rice. The campaign for a well-balanced diet is promoted ever since. Some Indonesian fruit and vegetable dishes such as fruit rujak, gado-gado, karedok, pecel, lalab, capcay, tofu and tempeh are known as healthy foods with low fat and high fibre. Tempeh, for example, is known to be a vegetarian substitute for meat. On the other hand, some dishes, especially gorengan (deep-fried fritters) and those dishes infused or caramelised with coconut milk, such as rendang and gulai, might taste succulent but are rich in saturated fat. The goat meat and offals cooked as gulai and soto are definitely categorised as unhealthy dietary choices as they are rich in saturated fat and cholesterol. The authentic traditional Indonesian home cooking is freshly made and consumed daily with minimal or no processed, canned or preserved foods, which means there is a minimal amount of preservatives and sodium. Most ingredients are bought fresh very early in the morning from local traditional markets, cooked around the late morning and consumed mainly for lunch. The leftovers are stored in the cupboard or on the table covered with tudung saji (weaved bamboo food cover to protect the food from insects or other animals), all in room temperature to be heated and consumed again for dinner. Traditionally, Indonesian dishes are rarely stored for long periods of time, thus most of these dishes are cooked and consumed in the same day. Some exceptions apply to dried, salted, and processed food. For example, dry rendang may still be safe to consume for several days. Modern refrigeration technology is available in most households. While most of Indonesian grocery products and food served in mid to upperscale eating establishments maintain food hygiene standard ranges from good to acceptable — regulated and supervised by Badan Pengawasan Obat dan Makanan (Indonesian Food and Drug Administration) — some warung traditional foodstalls and street vendors might have poor hygiene. The tropical microbes also might contribute to food poisoning cases mostly gastroenteritis, especially among foreigners during their stay in Indonesia. It is advisable to drink bottled or boiled drinking water, or choose cooked hot food instead of uncooked room temperatured ones sold by street vendors. For example, when consuming food sold by street vendors, consuming hot cooked mie ayam or soto is much safer than having gado-gado or fruit rujak. ^ as mentioned in Anthony Reid "Southeast Asia in Commerce 1450–1680 Volume I: The Land Below the Winds"
^ a b c d e "Food in Indonesia". Food by Country. ^ a b c d "Indonesian Cuisine." Epicurina.com. Accessed July 2011. ^ a b c d Nadya Natahadibrata (10 February 2014). "Celebratory rice cone dish to represent the archipelago". The Jakarta Post. Retrieved 9 July 2014. ^ a b "Indonesian food." Belindo.com. Accessed July 2011. ^ "Indonesian Cuisine". Diner's Digest. Archived from the original on 9 April 2011. Retrieved 11 July 2010. ^ "Flavours of Indonesia, Balinese Food". Destination Asia. Archived from the original on 17 August 2014. Retrieved 26 August 2014. ^ a b c Sara Schonhardt (25 February 2016). "40 Indonesian foods we can't live without". CNN. ^ a b "Nasi Goreng: Indonesia's mouthwatering national dish". Archived from the original on 6 July 2010. Retrieved 5 July 2010. ^ a b "National Dish of Indonesia Gado Gado". Archived from the original on 12 June 2010. Retrieved 5 July 2010. ^ a b "Indonesian food recipes: Satay". Archived from the original on 12 August 2010. Retrieved 5 July 2010. ^ a b "A Soto Crawl". Eating Asia. Retrieved 5 July 2010. ^ Media, Kompas Cyber. "Kemenpar Tetapkan 5 Makanan Nasional Indonesia, Ini Daftarnya - Kompas.com". KOMPAS.com (in Indonesian). Retrieved 18 April 2018. ^ "About Indonesian food". SBS Australia. 6 September 2013. Retrieved 26 August 2014. ^ a b Buxton, Kira Jane. "Incredible Indonesian dishes you need to try immediately". Mashed.com. Retrieved 11 December 2017. ^ "Makanan Zaman Kuno". Jawa Kuno (in Indonesian). ^ "Hanya Ada Di Candi Sojiwan: Menu Hidangan Raja Mataram Kuno". TEMPO.CO (in Indonesian). 22 February 2017. ^ a b c d e Yudi Anugrah Nugroho (18 December 2013). "Cita Rasa Kuliner Nusantara". Historia (in Indonesian). ^ "Menguak Fakta Menu Lalapan Sunda Lewat Prasasti Taji". beritasatu.com (in Indonesian). Retrieved 23 December 2017. ^ "Terungkap, Asal Mula Menu Lalapan | Dream.co.id". Dream.co.id (in Indonesian). Retrieved 23 December 2017. ^ a b Mike, Lininger. "International Dining Etiquette — Indonesia". Etiquette Scholar. Retrieved 28 May 2015. ^ Heinz Von Holzen (2014). A New Approach to Indonesian Cooking. Marshall Cavendish International Asia Pte Ltd. p. 15. ISBN 9789814634953. ^ a b c Taylor, Jean Gelman (2003). Indonesia: Peoples and Histories. New Haven and London: Yale University Press. pp. 8–9. ISBN 0-300-10518-5. ^ Witton, Patrick (2002). World Food: Indonesia. Melbourne: Lonely Planet. p. 29. ISBN 1-74059-009-0. ^ "Grilled tempeh burgers". Rachel Ray. 21 July 2009. ^ Scott, Janny (20 April 2011). "Obama's Young Mother Abroad". The New York Times. ^ "Ikan Bakar". Tasty Indonesian Food.com. Tasty Indonesian Food.com. Retrieved 11 August 2013. ^ "Mencicipi Gurihnya Keripik Olahan Jangkrik". Kompas.com (in Indonesian). 13 September 2016. ^ Ira Rachmawati (12 December 2014). "Menikmati Sepincuk Botok Tawon di Banyuwangi". Kompas.com (in Indonesian). ^ Fidel Ali (18 June 2017). "Apa Rasanya Makan Ulat Sagu Hidup-hidup di Raja Ampat?". Kompas.com (in Indonesian). ^ Kumar's Curries & Bumbus (2011). "Curries and Bumbus". Verstegen. Retrieved 24 October 2011. ^ Elliott, Petty (2011). "Food Talk: Spice Up Your Prawns With Sambal". Jakarta Globe, Indonesian Embassy in Athens. Retrieved 24 October 2011. ^ "Some Like It Hot! Bali Safari and Marine Park Holds Its 3rd Chili Festival". Bali Discovery Tours. ^ Maria Endah Hulupi (22 June 2003). "Betawi cuisine, a culinary journey through history". The Jakarta Post. Archived from the original on 14 September 2015. Retrieved 30 January 2015. ^ a b c "A Guide to Dutch Indonesian Cuisine". Awesome Amsterdam. Archived from the original on 6 July 2014. Retrieved 15 August 2014. ^ a b c d Luke Nguyen (5 December 2016). "Crocodile bread and spekkoek: the tasty intersection of Dutch-Indo food". SBS. ^ a b "Cuisine of the southern states". Food and Travel. ^ a b Kosaku Yoshino. "Malaysian Cuisine: A Case of Neglected Culinary Globalization" (PDF). Sophia University Institute of Comparative Culture, Tokyo. p. 3. Retrieved 2 May 2014. ^ "Consumers love succulent Satay, Peanut ingredients for global success" (PDF). USA Peanuts. p. 1. Retrieved 2 May 2014. ^ a b "Padang's Feast Fit for a King". Eating Asia. 10 July 2006. Retrieved 20 August 2013. ^ "A Unique of Padang". Padangbaycity.com. Archived from the original on 14 December 2010. Retrieved 22 September 2010. ^ Fadly Rahman (16 December 2010). "Rijsttafel: The History of Indonesian Foodways". Kompasiana. Kompasiana. Archived from the original on 21 September 2013. ^ Hyon Jung Lee (20 June 2007). "Most Expensive Coffee". Forbes.com. Retrieved 24 October 2011. ^ P.T. Data Consult, Inc (1999). "The Sinar Sosro Group: The Market Leader for Traditional Drinks". The Free Library. Retrieved 24 October 2011. ^ Andreas D. Arditya (14 April 2013). "A taste for spirits". The Jakarta Post. Retrieved 22 June 2017. ^ "Most popular 'kaki lima' in Jakarta". The Jakarta Post. Jakarta. 18 June 2016. ^ "Masyarakat Indonesia Kurang Asupan Protein Harian, Tiap orang dewasa 18 tahun ke atas memerlukan asupan protein satu gram per kilogram berat badan". National Geographic Indonesia (in Indonesian). 18 March 2013. ^ Melati Ifasari (28 September 2016). "Indonesian Raw Vegetable Salad with Peanut Sauce (Karedok): Excellent Idea for Your Raw Food Diet". food healthy life. ^ Mandy Oaklander (21 May 2015). "Should I Eat Tempeh?". TIME Health. ^ "Eating in Indonesia". Healthy Liv. 16 July 2015. ^ "10 Jenis Makanan Tidak Sehat Menurut WHO". Samishare (in Indonesian). ^ "Gastroenteritis and Food/Waterborne Diseases". Living in Indonesia. 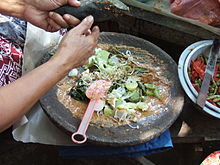 Wikimedia Commons has media related to Cuisine of Indonesia.